Why settle for bringing home the bacon when you can make your own Vegan Fakin’ Bacon? And bonus, you even get to skip frying it up in a pan, too! If you’ve never tasted plant-based bacon made from nutritious and wholesome ingredients, you may not believe that Vegan Fakin’ Bacon tastes just as irresistible as bacon that comes from pigs; but it does! Sauces, seasonings, herbs, and spices are the true originators of tasty flavor! In addition to the ridiculously addicting flavor of these bacony bits, the crazy cool thing about Vegan Fakin’ Bacon is that it doesn’t adversely affect our wellness by creating conditions ripe for high cholesterol, clogged arteries, and heart attacks. I use these delightfully crispy kitchen wonders in my Vegan 7-Layer Salad, where it works its magic perfectly. And you can also use these bits to toss on top of any salad, or even to make a Vegan Fakin’ Bacon, Lettuce and Tomato Sandwich or what I call an FBLT! 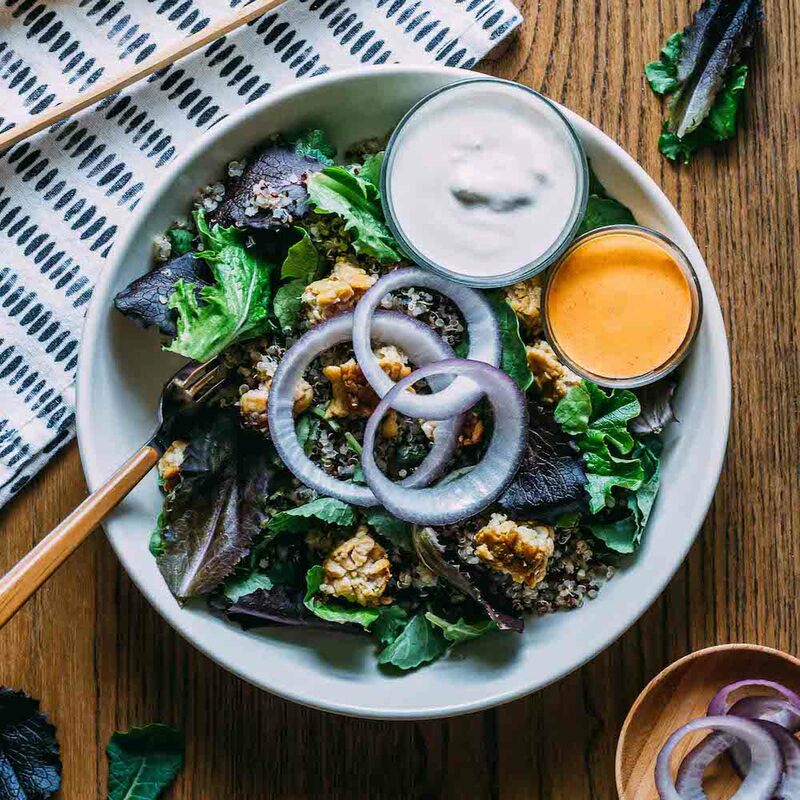 For the salad or an FBLT, you’ll want to be sure to make your own oil-free mayo with this delicious recipe! Another tasty way to use Vegan Fakin’ Bacon is to pile it high on a piece of warm, crispy toast topped with sliced avocado, a sprinkle of my Vegan Hard-Boiled Egg Crumble and, you guessed it, Vegan Fakin’ Bacon! If you are lucky enough to have leftovers . . .
use these flavor-packed-flakes to go wild and trick out a loaded baked potato! At my house, Vegan Fakin’ Bacon gets eaten right off the sheet pan as soon as it’s out of the oven! 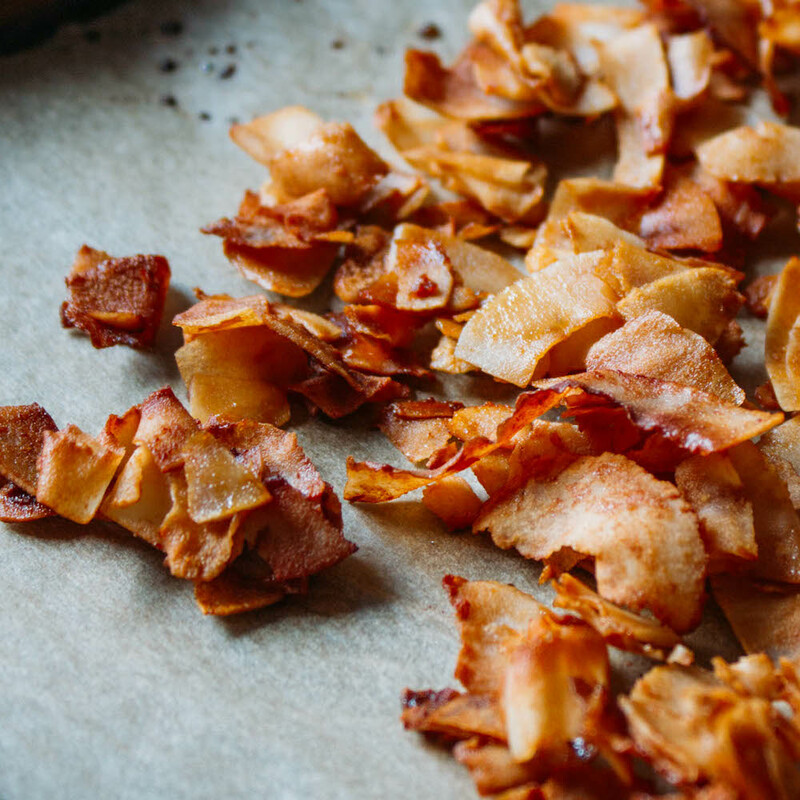 There’s rarely a crispy, sweet, salty, flake to spare. Oh, here’s an idea; if you would like to have leftovers for other culinary creations, why not make two batches? It keeps well in the freezer and doesn’t even require defrosting. So, may there be plenty of Vegan Fakin’ Bacon in your freezer, always! Use this quick and delicious Vegan Fakin’ Bacon in salads, sandwiches, wraps and everywhere else you might add bacon but prefer something WAY healthier! 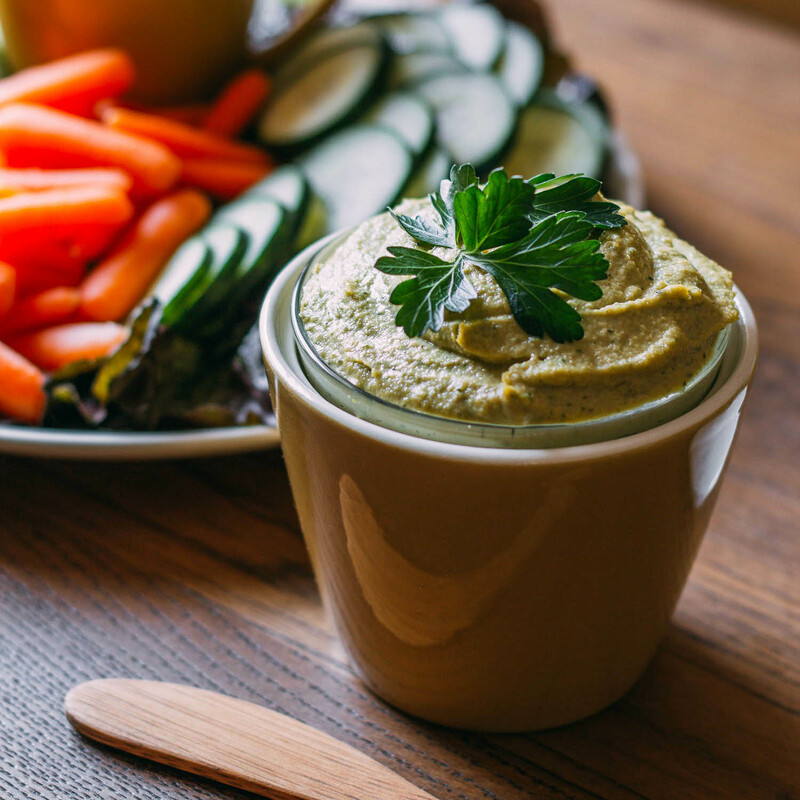 And if you’re opting to enjoy this in an FBLT sandwich or wrap, be sure to make a delicious batch of homemade oil-free mayo while you’re at it! Vegan Fakin’ Bacon is plant-based, soy-free and gluten-free as long as you use Gluten-free Tamari rather than regular soy sauce. Make a couple of batches and store one in the freezer for next time. Each recipe yields about two cups. Two tablespoons equal about one serving. Preheat the oven to 350º Fahrenheit and then line a large baking sheet with parchment paper for easy handling and cleanup. First, place the coconut flakes in a medium-size mixing bowl. 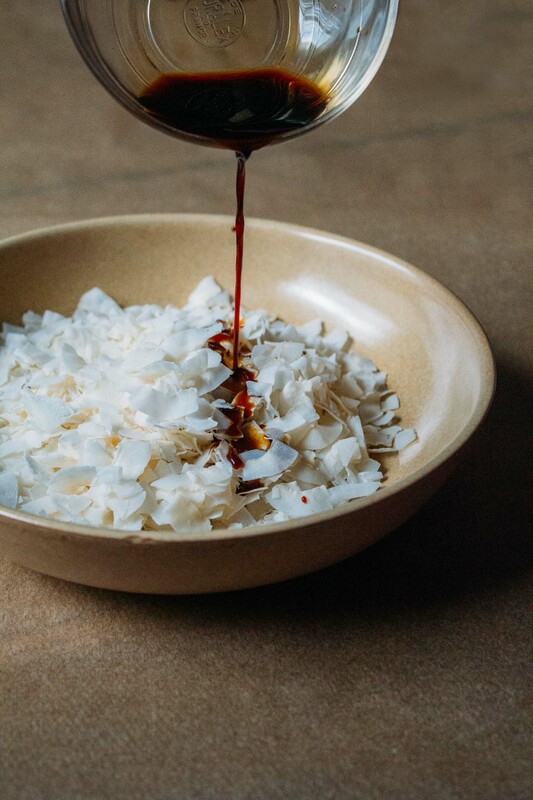 Next, drizzle the coconut flakes with the tamari, liquid smoke, and pure maple syrup. Because different brands deliver various levels of smoky flavor, you may wish to take things slow. Try adding 1/2 tablespoon of liquid smoke at a time until you reach the taste you prefer. If the brand you are using requires a little more or less than what I've specified, no problem! Season your Vegan Fakin' Bacon to your preference. 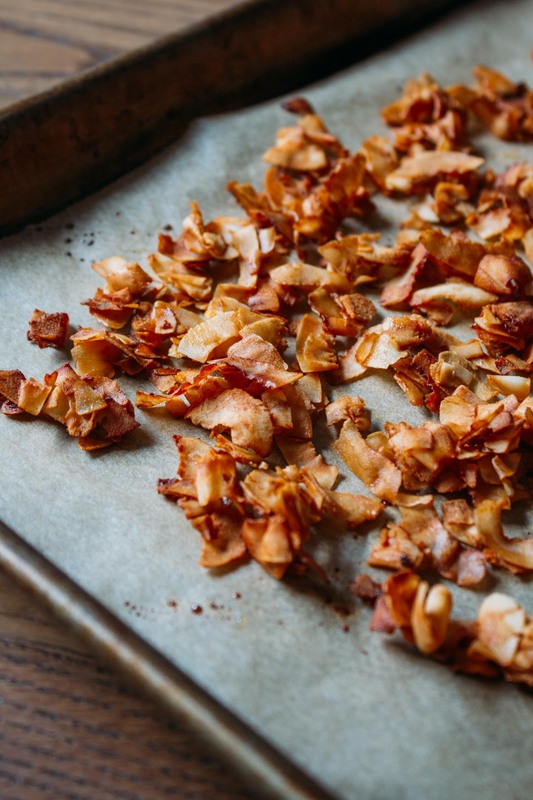 Now, gently stir, being sure to cover each coconut flake with the magical bacon-ish seasoning. Add a very lite dash of sea salt and give the mixture one last toss. Taste and adjust the seasoning as needed. Once this taste is to your liking, spread the coconut into an even layer on the parchment paper covered sheet pan. Place the sheet pan on the middle rack of the oven and bake for about five to six minutes. After the five or so minutes of baking, remove from the oven and gently flip the coconut flakes. Return the flakes to the oven and bake until mostly dry and turning slightly golden on the edges. It usually takes no more than an additional 4 to 6 minutes to finish drying out the coconut. Be sure to keep a close watch on your Vegan Fakin' Bacon as it can go from golden brown to dark burnt brown rather quickly. When I have my Vegan Fakin' Bacon in the oven at this point in the recipe, I do nothing other than stand in front of the stove and wait; otherwise, I get distracted for one minute too long and burn the bacon. For softer bacon, you will only need to bake for a total of about 10 to 12 minutes. For extra-crispy bacon, be thinking more like 12 to 14 minutes, but you will need to watch as not to burn and also note that oven power tends to vary. Additionally, Vegan Fakin' Bacon becomes crispier as it cools. After your Vegan Fakin' Bacon cools, use immediately or transfer to a freezer-safe container. Vegan Fakin' Bacon will store well in the freezer for months! And there's no need to defrost before using - take it out when you crave it, trust me, you will, and munch! This dish is gluten-free as long as you use gluten-free tamari rather than soy sauce. Tamari is a variety of soy sauce that is usually gluten-free. I choose to use tamari instead of soy sauce because it tastes terrific and allows anyone with gluten restrictions to be able to enjoy a bite of my Vegan Fakin' Bacon! If you're not purchasing recipe ingredients through the handy-dandy clickable Amazon links on my recipe listings, you can typically find tamari next to the soy sauce in the Asian aisle. As for the coconut flakes, I attached a link that offers a competitive price when you purchase two pounds. 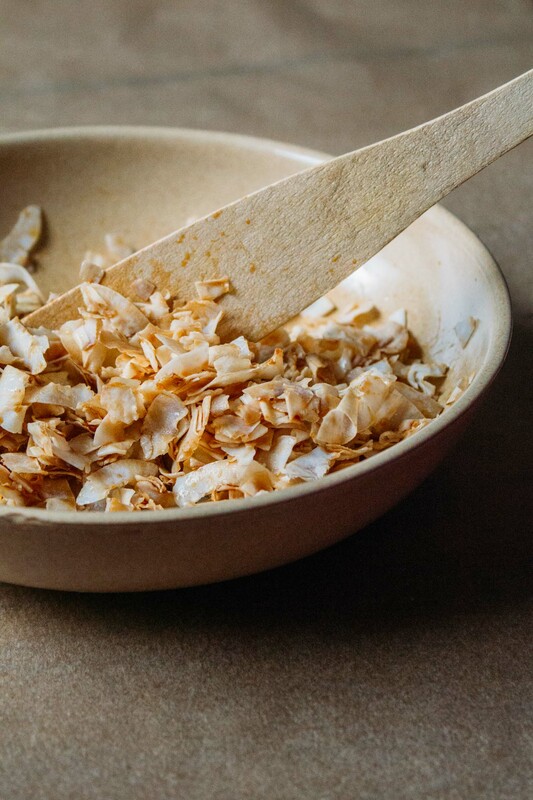 Coconut flakes all on their own are a super healthy snack that feels like a treat... I keep them in my pantry for snacking, always! Look for liquid smoke near the barbecue sauce in most stores. And coconut flakes are usually in the baking aisle or found in the health food section of most well-stocked grocery store. I must thank CookieandKate.com for the inspiration to make my own coconut "bacon." 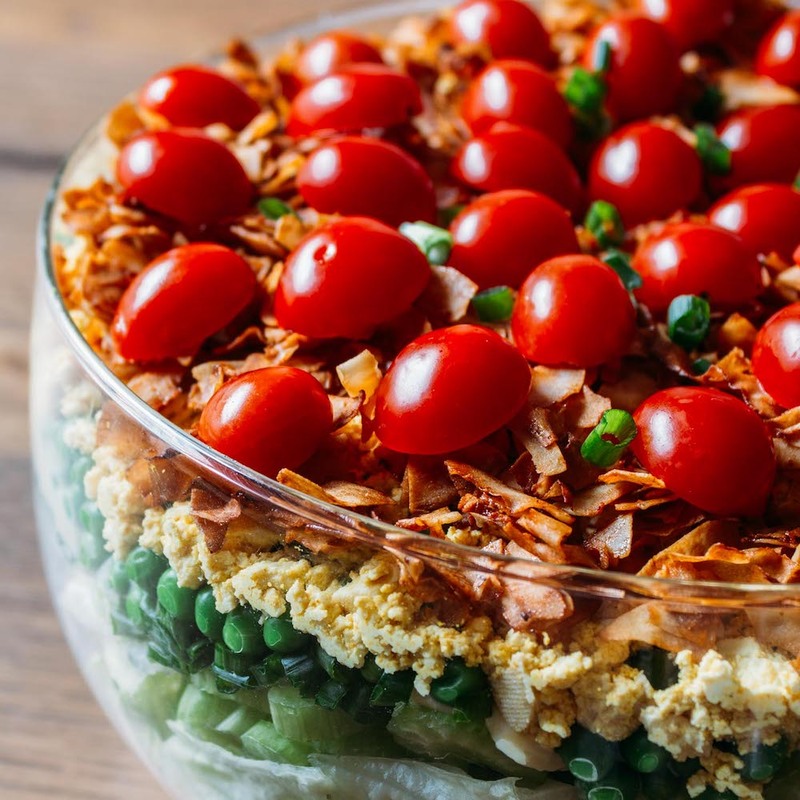 Alternatives to bacon and other familiar flavors give a friendly nod to the comfort foods we love, making it easy, and tasty, to live a plant-based, cruelty-free lifestyle. This looks and sounds amazing! I can’t wait to give this a try, I have everything aside from the coconut flakes, so I will be getting some on my next visit to the supermarket. I’m so glad you enjoyed the post, Nate. And thank you for your kind words. I can pretty much guarantee that you’ll start snacking as soon as the pan comes out of the oven… so, so good. These were very good. We ate them with pancakes and they provided just the right amount of savory. Thanks for letting us know how the Fakin’ Bacon went over, Jane. “Just the right amount of savory” describes this recipe perfectly!